View of the beaches on the island of Oahu. What’s the Difference Between Oahu, Honolulu and Waikiki? 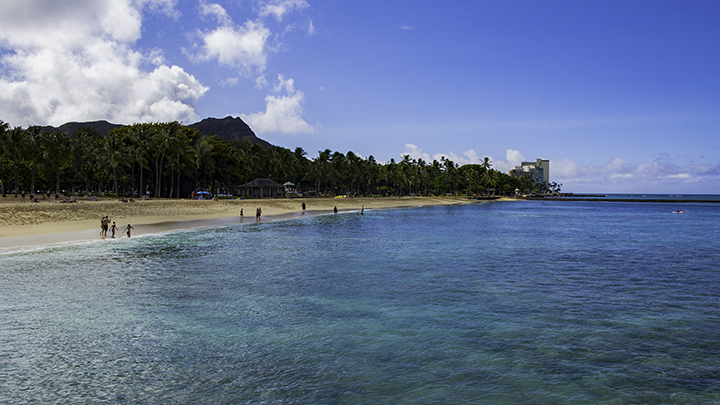 Some may be confused as to the difference between Oahu, Honolulu and Waikiki. This may be especially true for first time visitors to Hawaii. Apparently, there must be something to this. This is because you can see many questions on this subject on travel websites and blogs. Some even confuse Oahu with the Big Island of Hawaii. We’re not sure why there is this confusion, but it is there. So, the purpose of this blog is to clear up these areas of confusion. Oahu is one of the main 8 islands in the Hawaiian lslands chain. At nearly 600 square miles, it is the third largest of all the islands. To give you a sense of scale, Oahu itself is about half the size of the State of Rhode Island. The largest Hawaiian Island is commonly referred to as the Big Island or Hawaii island. The second largest island is Maui. Most of Hawaii’s 1.4 million population lives on Oahu. Oahu has a population of nearly 1 million people. It is also the business hub of the Aloha State. Oahu is the most visited island in Hawaii. Of the over 9 million tourists that visit Hawaii every year, roughly two-thirds of them come to Oahu. 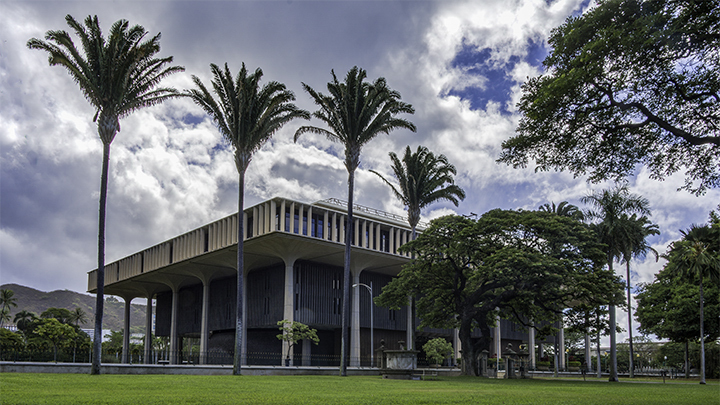 The State Capitol Building in Honolulu. One can find Honolulu on the island of Oahu. Honolulu is Hawaii’s largest city. It is also the State of Hawaii’s capital. Honolulu covers an area from the southeast end of Oahu, south of the Ko’olau Mountain Range, to the east end of Pearl Harbor. Honolulu county encompasses not only the city of Honolulu, but also the entire island of Oahu. Because of this, it is officially called the City and County of Honolulu. Possibly because of this, many locals say that they’re traveling to Honolulu, rather than Oahu, when coming from another island. View of Diamond Head in Waikiki. Waikiki is quite possibly the most famous place in Hawaii. Many know it as a world-class tourist destination area. 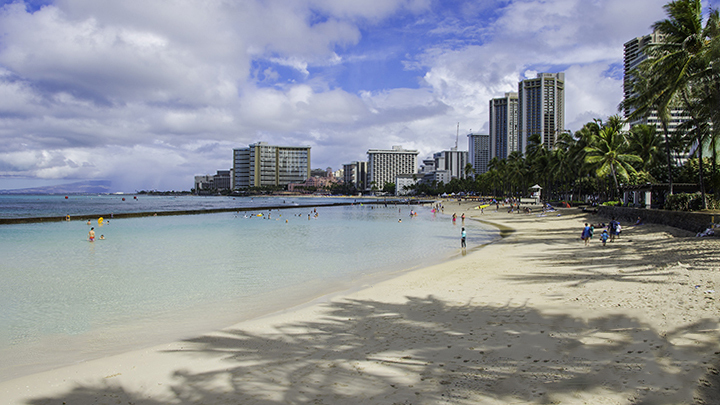 Waikiki is the area with the most hotel rooms in the state exceeding 28,000. Waikiki area is an area within the city of Honolulu. The Ala Canal Wai is the north and west boundaries of Waikiki. While Diamond Head represents the east end of Waikiki. The tranquil Pacific Ocean faces the south end of Waikiki. Want a short answer to the question of what is the difference between Oahu, Honolulu and Waikiki? If so, here it is. Waikiki is a district in Honolulu. Honolulu is a city on Oahu. So, you can find both Waikiki and Honolulu on the island of Oahu.